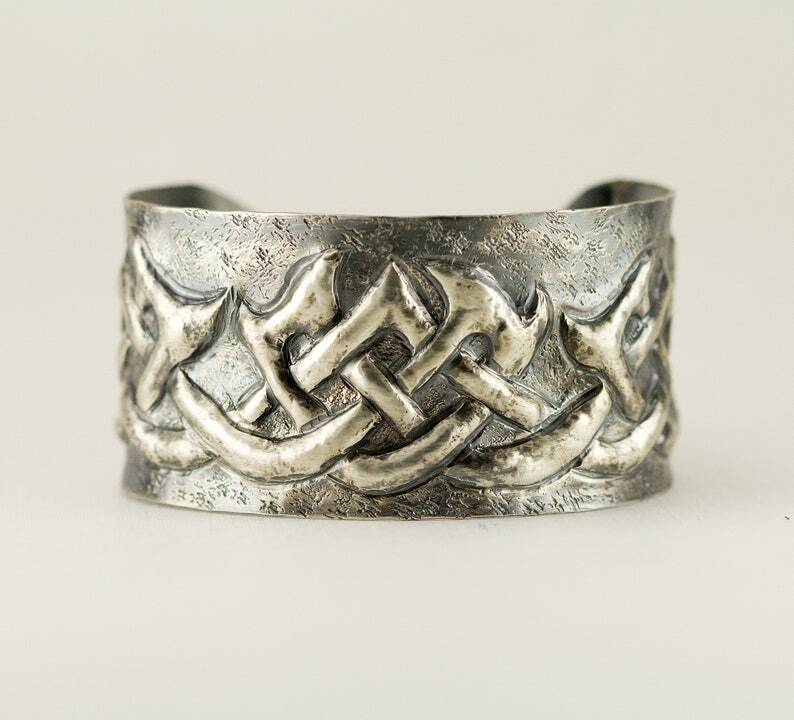 This sterling cuff bracelet features a 3 dimensional pattern of a Celtic knot against a textured background. This 1 1/4 inch wide bracelet cuff was made using the ancient technique of chasing and repousse, a labor intensive technique using a hammer and handmade specialized tools of various shapes and sizes to hammer from behind and define and smooth in front to form this unique endless know bangle. A design is drawn then created by hammering the tools on the metal. The metal is fixed in pitch and flipped back and forth until the design is clear and crisp. This cuff has been oxidized to highlight the pattern detail. 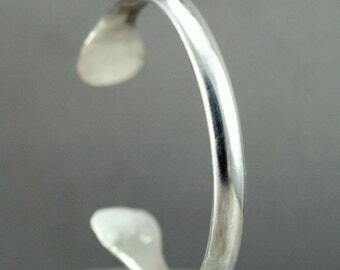 This cuff is made from heavy gauge sterling and was formed on an oval mandrel to conform to the shape of your wrist. Last photos shows the initial progress shot just so you can see how things go from flat to 3 dimensional! This cuff has been work hardened from the hammering and texturing around the design but is still flexible enough to squeeze tightly to your arm or gently pull apart to widen the opening. This cuff was hand crafted in my home studio. It is one of a kind!